In newly-surfaced letters from Benedict XVI, the pope emeritus has defended his abdication, and warned that continued anger at his decision risked undermining the papal office. The private correspondence, excerpts from which were carried in a German newspaper, was reportedly addressed to Cardinal Walter Brandmüller. German newspaper Bild carried the excerpts in a story published Sept. 20. The letters were originally sent in November, 2017. Bild did not name the recipient but referred to him only as “a German cardinal” who had made critical comments about Benedict’s resignation in an interview. On the same day, The New York Times reported that it had received a copy of the two letters in their entirety from Bild, and named Cardinal Brandmüller as the recipient. Addressing the ongoing dissatisfaction some individuals had with both his resignation and his subsequent life as “pope emeritus” – a title not previously used – Benedict cautioned that these sentiments were undermining the effectiveness of the petrine ministry. 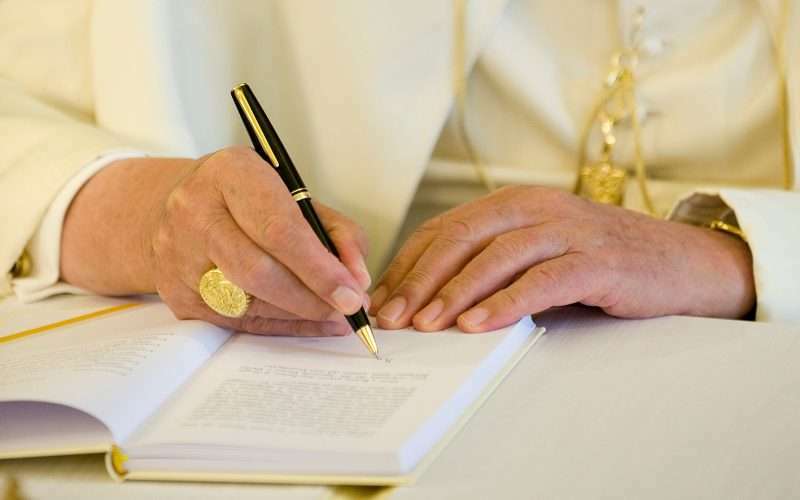 “In this way the pontificate itself is being devalued and conflated with the sadness about the situation of the Church today,” he wrote. “The fact that a pope comes along and topples a 2,000-year-old tradition bowled over not just us cardinals,” he said. Benedict alo cited the example of Pope Pius XII, who considered stepping down in 1944 in the event of his arrest by the Nazis authorities then occupying Italy. Pope Pius had considered returning to the rank of a cardinal in the event of his resignation. Benedict explained that he was concerned with avoiding the impression that there were two popes, with his comments being sought on the ministry and decisions of his eventual successor. In the second letter, dated Nov. 23, 2017, Benedict wrote that he was concerned by the conclusion of Cardinal Brandmüller’s interview with Frankfurter Allgemeine Zeitung, given the previous month. The pope emeritus said that it could promote the sort of agitation which had inspired “the Abdication,” a book by Fabrizio Grasso which argued that having emeritus popes could destroy papal authority. Cardinal Brandmüller is one of four cardinals to have submitted five formal questions or “dubia” to Pope Francis, asking the pope to clarify some points of Church teaching in the wake of differing interpretations of Amoris laetitia, Francis’ 2016 post-synodal apostolic exhortation. The letters from Benedict were reported by Bild two years and one day after the dubia were sent. Brandmüller submitted the questions, together with Cardinal Raymond Burke, Cardinal Joachim Meisner, and Cardinal Carlo Caffarra, on Sept. 19, 2016. Previous PostWhy can't a priest ever marry?